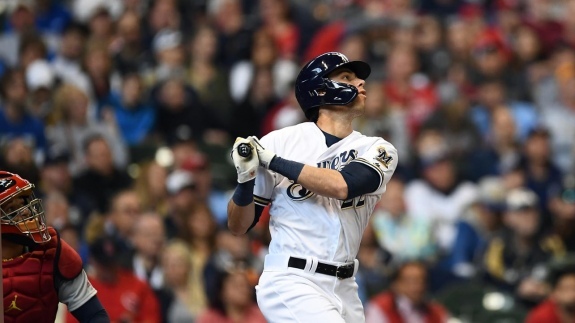 On Opening Day, Milwaukee's Christian Yelich hit a 3-run, third-inning homer off of St. Louis' Miles Mikolas. Rewind to Game 1 of the 2018 National League Championship Series. We were seated in Miller Park's upper deck on the third base side as Milwaukee Brewers manager Craig Counsell pulled starting pitcher Gio Gonzalez after two innings and handed the ball to reliever Brandon Woodruff to start the third. Woodruff not only provided two scoreless innings and earned the win, but he also hammered a solo home run off of Los Angeles Dodgers ace Clayton Kershaw in the bottom of the third inning. The Brewers claimed an early 1-0 NLCS lead. Tonight, 26-year-old Brandon Woodruff (0-0, 0.00 ERA) will make his 2019 regular season debut for the Brewers (1-1, .500). We were in attendance at Montreal's Olympic Stadium to see Woodruff's final spring training appearance on March 25. Last year, he appeared in 19 regular season games and compiled a 3.61 ERA over 42 1/3 innings. Of those 19, only four were starts. The St. Louis Cardinals (1-1, .500) will send 24-year-old Dakota Hudson (0-0, 0.00 ERA) to the mound for his season debut. Hudson, who broke into the majors during 2018, made 26 relief appearances last season. During those 26 appearances, he compiled a 4-1 record with a 2.63 ERA in just 27 1/3 innings. Today, he will make his first career start. As Opening Week continues, the Brewers and Cardinals split the first two games of a 4-game series in Milwaukee. Milwaukee won the opener, 5-4, but the Cardinals claimed last night's game, 9-5. Both teams quickly quelled any doubts about early-season offensive production as St. Louis and Milwaukee combined for 11 home runs during the first two games. The Cardinals cleared the wall six times. Paul Goldschmidt slugged three last night alone. During the opener, Kolten Wong hit two and Harrison Bader contributed one. The Brewers belted five. Reigning NL MVP, Christian Yelich, hit one in each game. Ryan Braun, Mike Moustakas and Jhoulys Chacin (yes, the pitcher) each have one of their own. 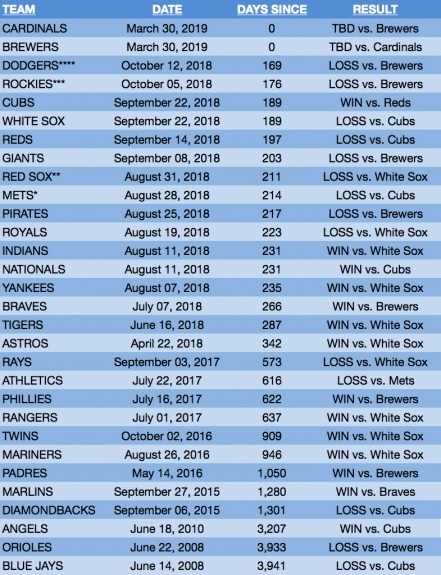 To kick off the 2019 season, here is the last time I watched each MLB team play live during a regular-season or postseason game. Sorry, spring training does not count. **Left during 2-hour rain delay; game resumed at 10:05 p.m.
Edit: The team chart posted on February 5, 2019, incorrectly listed the last Chicago White Sox game as a win against the Boston Red Sox. It should have been a loss to the Chicago Cubs.